It’s 1 June and by rights the UK should have been preparing to launch its Presidency of the European Union. Instead of leaving the EU, the UK could have been running the EU. So what if David Cameron had delayed his EU referendum till after the UK’s Presidency? What if the EU referendum had not taken place on 23 June last year? What if David Cameron had waited? Writing in the Guardian, Steve Richards asserts that if David Cameron had chosen a different date for the referendum, he would have won. He doesn’t explain why, but for the reasons I set out below, I suspect the outcome could have been different. The timing of the referendum was a matter of political choice. The legislation which made provision for the referendum simply stated that it should take place by 31 December 2017, and even that was a political choice enshrined in law. It could have been changed. The decision to go for June 2016 was the result of a number of factors. First, having managed against expectation to secure an election victory in 2015, David Cameron did not want his premiership overshadowed by the issue of Europe. After all, he had also made clear that he would not be seeking to continue as Prime Minister after the scheduled 2020 election. He wanted the issue resolved and resolved quickly rather than having to deal with those in his party ‘banging on about Europe’. Second, a Spring 2016 plebiscite was not going to work given his plans for EU reform and renegotiation before a referendum. The final deal on his ‘new settlement’ with the EU had been delayed after the December 2015 European Council failed to complete negotiations. Although agreement was reached in February 2016, the statutory ten-week referendum period would have risked a clash between the EU referendum and elections to the devolved parliaments in May. Third, an Autumn referendum would have been an option following the summer recess and party conferences. But given the harrowing scenes the previous summer of refugees risking – and losing – their lives in the attempt to reach safety in Europe, a repeat over the summer of 2016 would be a difficult backdrop for the Prime Minister to make his pitch for the UK to remain in the EU. But David Cameron did have other options. The instinct to seek EU reform and renegotiation prior to a referendum was probably the right one but it wasn’t executed properly. This is not merely to repeat the attacks on David Cameron’s ‘new settlement’ renegotiations which were immediately trounced by his critics including the Eurosceptic press. Actually, as deals go, it wasn’t terrible. There was some substance to it and real concessions were made in relation to respecting the rights of non-Eurozone countries and in laying out a basis for legislative changes that would have restricted somewhat access to in-work benefits for migrant workers. The mistake was not to see this as Phase I of a three-stage process which would have pushed back the timetable for a referendum. The renegotiation stage was never going to deliver a knock-out punch that would have tipped the result in his favour. If anything it became a rod for the Prime Minister’s back; a distraction from the real task of making the case both for EU membership and for future reform. Moreover, it focused attention on EU constitutional and institutional change more than it did on the delivery of common EU policies that might yield domestic social and economic benefits. The Prime Minister should have been looking ahead to Phase II of a strategy: the UK’s Presidency of the EU that would start in July 2017. These rotating presidencies are often technical affairs of giving each Member State a turn at running the agenda of the Council for six months, with each presidency seeking to close deals on outstanding legislative dossiers. But they could be an opportunity for a Member State to decide to run with the idea that it is actually shaping the politics and policies of the EU. Summits can be convened. Declarations can be made. Statements of intent can be issued. What would have stopped David Cameron from setting out a policy agenda designed to show the electorate that cooperating with EU countries could be a force for good? Why wouldn’t EU leaders have wanted to offer a UK Prime Minister facing a difficult referendum every opportunity to show how working across borders was in the UK’s interest? Of course, it would be important to pick out some key priorities. And if we learn something from the 2016 referendum campaign, it is that the ephemera of low-cost air transport, falling roaming charges and access to emergency healthcare while on holiday doesn’t cut it with an electorate that is more concerned with how global markets and porous borders make people feel insecure. So here are three things a UK government could have run with. There is a degree of hindsight in that the issues chime with themes of the 2016 referendum campaign. But they were themes of the campaign and not products of them. The three examples are illustrations of how a UK Presidency could have been framed to build a case for retaining EU membership in a referendum to follow. The first focal point would be around trade. As dramatised not just by the 2016 referendum but also the Trump and Le Pen election campaigns, support for ‘free trade’ has weakened on the Right as well as the Left. Instead of dragging its feet on the reform of EU trade defence instruments (‘TDIs’) – with the Commission having produced new proposals back in 2013 – the UK could have got on board with a strategic reform of EU TDIs – with a clear commitment to complete legislative changes under its EU Presidency. Free trade would need to be fair trade. The second thing it could have done would have been to reframe some of the debate about people and borders by focusing on issues of exploitation. Part of that initiative could have been around trafficking of people, focusing on enhancing cross-border police and judicial cooperation. But another part could have been about steps to prevent the exploitation of migrant labour. To be sure this wouldn’t deal with the issue of the numbers of people moving to work in the UK (the ‘new settlement’ dealt with some of the access to benefits side of things). And it would need to be complemented by domestic policies around restoring funding to councils facing particular pressures on public services (the Conservative-Liberal coalition having axed the fund that Gordon Brown had established). But it would help reframe some of the discourse to focus on migrants as potentially vulnerable people. The third thing would be to look at what the EU budget is spent on. One of the problems the EU faces is the disconnect between what the EU does and what Member States do. The fundamental aspects of the welfare, education and health services which people care about and which influences their voting behaviour are provided nationally. The EU’s budget is spent on other things including supporting the income of farmers, regional development, and education and research. With a view to a wider reform of the EU budget, a UK Presidency could have championed an initiative to earmark part of the EU budget to support a major new drive to cut cancer rates across the EU. This would include new research and help to ensure the availability of cancer treatments. Given the domestic political problems around the high costs of cancer drugs and the use of national budgets to support cancer treatments, this could be an opportunity to harness the EU budget to support national healthcare. It would not be realistic to think that the Prime Minister would have wished to hold a referendum on EU membership during the UK’s Presidency. On that basis, the artificial deadline of the end of 2017 would have needed to be changed. But there is another reason to push back the date. The final phase of the process would be for the UK to support a wider process of EU reform. The 60th anniversary of the Treaty of Rome would be celebrated in the months leading up to the UK Presidency and with it, a process of reflection would begin on the future of the EU. The UK could have taken the initiative to lead this process of reflection during its Presidency with a view to seeking common ground on the reforms that the EU needs to its budget, to its processes and its institutions. The elections to the French Presidency and the German Chancellorship would have been completed by the end of a UK Presidency. While again we need to be careful about hindsight, would a Cameron, Macron and Merkel show of unity have helped drive a process of European political and treaty reform (aided by the alternative universe of a Trump White House)? For good reason, David Cameron believed that a referendum on a future reform treaty would not suffice. At its simplest, the risk that ratification problems elsewhere in Europe would render a referendum in the UK redundant and so deny voters the opportunity to express their views was all too apparent. However, the UK could have made clear in advance that it would immediately hold a referendum on any new treaty and that as this new treaty was about setting the course for the EU’s future, any rejection by the UK electorate would be tantamount to a rejection of membership (but with wiggle room for a further round of negotiations should the treaty be rejected). Other EU states would need to await the outcome in the UK. It would be folly to claim that the outcome would have been obviously different. But it can be argued that a phased approach to an EU referendum would have given David Cameron more options. The UK’s Presidency of the EU was an opportunity squandered. The Court of Justice has delivered its long-awaited Opinion 2/15 on the scope of the EU’s trade powers under the so-called ‘Common Commercial Policy’ (’CCP’) of the EU (Article 207 TFEU) as well as the EU’s ‘implied’ trade policy powers. It is a ruling of interest to trade lawyers, but it will also be pored over by the UK Government and its lawyers when they consider the scope of the EU’s powers to negotiate and conclude a post-Brexit trade deal with the UK. At the heart of the ruling is the question of the extent to which the EU’s trade powers are exclusive to the EU, and in what respects trade agreements engage powers that are retained by, or shared with, the Member States albeit that the Member States’ powers are exercised in a coordinated fashion and in conjunction with the EU. This issue has been a long-running saga of EU trade law and policy and was dramatized most clearly in the context of the EU’s recent trade deal with Canada. Despite the European Commission’s belief that the deal fell within the scope of the EU’s exclusive powers – and so could be negotiated by the Commission on behalf of the EU and concluded by the EU without the need for national approval – it decided to proceed on the basis that the deal was a ‘mixed agreement’ – involving issues of exclusive and shared competence – and so required domestic approval. When the Walloon parliament held up Belgian approval of the deal, there were fears that the EU’s trade policy was unravelling just at the moment that the UK was preparing to leave the EU and seek a new deal with the EU. As EU Trade Commissioner Malmström quipped at the time, ‘If we cannot make it with Canada, I’m not sure we can make it with the UK. But jokes aside …’ In the end, a solution was found to manage the concerns of the regional parliament but the saga highlighted the role of national – and even sub-national – parliaments as veto players in future Brexit negotiations. It ought then to be clear that the more that can be done by way of a trade agreement falling within the scope of the exclusive trade powers of the EU then the risks from domestic vetoes or delays might be mitigated. Which is why all eyes were on what the Court of Justice would produce in its opinion on the EU-Singapore trade deal and the scope of the Union’s express trade powers under the CCP as well as any implied trade powers (which could also give rise to exclusive EU competence). Before turning to the ruling, there is a simple point worth repeating not least because it is a point that UK ministers continually fail to grasp. The more cavalier Brexiteers in the UK government take the view that everything is possible in the negotiations which lie ahead. Moreover, there is still an apparent difficulty in accepting that the negotiations will be phased not just in terms of the Article 50 withdrawal process itself, but also the negotiations that will continue and follow when the UK leaves the EU and becomes a non-Member State. From the EU’s perspective, what is possible – legally and politically – is framed by the treaties and the powers it confers on EU institutions to negotiate, agree and conclude deals. Different provisions of the treaty – the ‘legal bases’ which give legal authority to EU institutions – apply to different parts of these negotiations and have their own procedural rules. It is the irony of Brexit that the EU is not sovereign but a Union based on attributed competences and the rule of law such that what the EU negotiates and concludes can be legally reviewed before the EU courts. So the immediate question that the Court’s opinion raises is whether it pushes Brexit negotiators on both sides towards concluding a trade deal within the confines of the EU’s exclusive competence in the hope that this will avoid vetoes from either national governments – much of the CCP can also be agreed by a qualified majority vote rather than unanimity – or their national parliaments. But it also sheds a light more widely on the relationship between, on the one hand, the bundle of agreements that will be needed to manage the Brexit process, and on the other hand, what the treaties substantively allow and procedurally require in order for negotiations to be lawful as a matter of EU law. On the first point, the main take away from the Court’s opinion on the EU-Singapore deal is how much can be done within the scope of Article 207 TFEU. The point is of crucial importance to Brexit given that the Singapore deal – like the Canada agreement – is broad and ambitious and goes beyond the usual suspects of international trade agreements, namely the removal of tariff and non-tariff barriers to the market access of goods and services. Indeed, the EU-Singapore agreement contains seventeen chapters extending to issues of intellectual property, procurement, competition, investment, sustainable development and renewable energy generation. In principle, a very ambitious and comprehensive trade agreement can fall within the scope of Article 207 TFEU. Indeed, chapters of an agreement that deal with issues of social and environmental protection – matters where the EU has a limited and shared internal competence – can, nonetheless, fall within the scope of the CCP because they seek to ensure that free trade is also fair trade. Indeed, the Court finds that ‘sustainable development’ is an integral part of EU trade policy. Some things do not fall within the CCP and the issue arises whether, despite this, the fact that the EU has internal (intra-EU) rules in a field creates a parallel implied and exclusive external EU competence. In terms of international transport services, the express wording of Article 207(5) TFEU excludes this from the scope of the CCP. However, the EU does have an external competence to conclude international agreements under Article 216 TFEU and where the EU has common internal rules on transport services, the conclusion of an international agreement under Article 216 TFEU which would impact upon those rules, also gives the EU exclusive competence. Foreign ‘direct’ investment is covered by Article 207 TFEU but not other indirect forms of investment. And it is here that the Court’s Opinion finds that the EU does not have exclusive competence to adopt and conclude the chapter on investment insofar as it extends beyond direct investment. Equally the institutional provisions relating to exchanges of information and cooperation relating to non-direct foreign investment cannot be concluded by the EU acting alone. Moreover, the dispute resolution mechanism relating to investor-state disputes also cannot be adopted by the EU alone (although the dispute resolution mechanism applicable to the parties to the agreement itself is within the competence of the Union in the same way as the substantive provisions which the mechanism is designed to enforce). It is the non-direct investment and the investor-state dispute resolution mechanisms which are the problematic areas of the EU-Singapore deal. But the bulk of this comprehensive agreement does fall within the scope of EU exclusivity and could form the basis for an ambitious Brexit trade deal following the UK’s withdrawal from the EU. While the new generation of bilateral EU trade deals do involve chapters on investment and investor-state dispute resolution, it would not be inconceivable to negotiate a parallel bilateral investment treaty (‘BIT’) between the UK and the EU as well as its more substantive Brexit trade deal. In this way, any difficulties with ratification of the BIT would not produce contagion effects to threaten the agreement and conclusion of a trade deal. It is important to keep in mind that the Court’s Opinion is relevant to the agreement that the UK will conclude with the EU when the UK ceases to be a Member State. It’s relevance assumes that the UK Government sticks to its apparent direction of travel, namely, not to conclude an ‘association agreement’ with the EU when it leaves. In terms of Article 217 TFEU, association agreements require the unanimous agreement of all national governments. Moreover, given their wide scope, they are mixed agreements and so require domestic approval. As the EU-Ukraine Association agreement highlighted, domestic approval processes can include a referendum as was the case when voters in the Netherlands voted to oppose approval. While an association agreement would be a softer Brexit, it may be that the Court’s Opinion on the CCP will harden the government’s approach to seek a trade agreement that avoids domestic approval processes in other EU states. Either way, before any of this can occur, the negotiations need to get underway on the withdrawal agreement itself. That agreement is based on Article 50 TEU directly. Like Article 207 TFEU, it is a legal basis that empowers the EU to adopt an agreement with a withdrawing state under certain substantive and procedural conditions. The process is now underway with the European Council establishing guidelines for the negotiations, and the Council preparing negotiation directives for the European Commission who will conduct the negotiations on behalf of the Union. The agreement will be concluded on behalf of the Union by the Council, with the consent of the EP. There is no requirement as a matter of EU law to seek domestic approval in the parliaments of the EU27: an Article 50 TEU agreement is not a mixed agreement but rather one concluded on behalf of the Union. That will limit its scope to managing the immediate consequences for the UK and the EU of withdrawal rather than setting out detailed future relations between the UK, on the one hand, and the EU and its Member States, on the other. The complication, however, is in respect of any ‘transitional arrangements’. Such arrangements would act as a bridge between the UK’s status as a Member State, and its status as a ‘third country’. In terms of the EU’s preferred sequencing of negotiations, the discussion of transitional arrangements would form part of Phase II of the negotiations once sufficient progress has been made in Phase I dealing with citizenship rights, outstanding liabilities and border issues relating to the UK and Ireland. It would seem, then, that Article 50 provides a legal basis for such a transitional arrangements. But clearly that creates a potential tension if such arrangements proved to be a long-standing means of managing the UK’s relationship with the EU in that they would, over time, undermine the EU’s specific external trade policy powers. More likely, they will need to be time-limited in order to form part of a withdrawal agreement (or bundle of agreements) based on Article 50 TEU. All of which serves to reinforce the point that even if the UK and the EU can agree on what they both want, they may profoundly disagree as to the legal route to getting there and the timing of the stages of the process. The UK’s decision to withdraw from the EU is a choice. It is a choice with consequences not just for the UK but for others. It has particular consequences for Ireland but also for Denmark: the two countries that joined the EEC at the same time as the UK. Barnier drew attention to the particular challenge of reconciling the removal of borders within the island of Ireland with the requirements of customs and other controls to protect the Single Market, with the issue of the border between Ireland and the UK forming part of the first phase of Brexit negotiations. In view of the unique circumstances on the island of Ireland, flexible and imaginative solutions will be required, including with the aim of avoiding a hard border, while respecting the integrity of the Union legal order. In this context, the Union should also recognise existing bilateral agreements and arrangements between the United Kingdom and Ireland which are compatible with EU law. Leaders of the EU27 also agreed to record in the minutes of the meeting that in the event of a unification of Ireland pursuant to the Good Friday Agreement – based on the consent of the people expressed in referendums – EU membership would extend to the island of Ireland in the same way as occurred following the unification of Germany. Not all consequences of Brexit are negative for Ireland. As the Taoiseach noted following the European Council meeting in April – and as he repeated in his reply to Michel Barnier’s speech – Ireland will be putting itself forward as a candidate to host the European Medicines Agency (EMA) and the European Banking Authority when these relocate from London after Brexit. There will be competition for EMA from Denmark who had also revealed that it would be throwing its hat in the ring, as well as from Denmark’s close neighbour Sweden, whose government also announced that it would be actively working to bring EMA to the Stockholm-Uppsala region. All of which dramatizes that while the UK, Ireland and Denmark may have joined together, the departure of the UK will not result in their departure too, but instead binds Ireland and Denmark more closely to the EU and its Single Market. Adapted from the final chapter of Brexit Time to be published by Cambridge University Press next month. The UK didn’t join the EEC on its own in 1973. Denmark and Ireland also chose to join with it. Denmark and Ireland became Member States because the UK had chosen to join the EEC. The balance of interests – political and economic – made Danish and Irish EEC membership together with the UK a logical step. The UK’s departure from the EU has consequences for both countries but it is unlikely to lead to either country choosing to leave the EU. Like the UK, Denmark has, over the years, secured a more differentiated membership in terms of its choices whether to participate in areas of EU co-operation. Following the original rejection of the Maastricht Treaty in a referendum in 1992, Denmark secured three ‘opt-outs’ concerning monetary union, defence co-operation, justice and home affairs and a clarification that EU citizenship did not replace national citizenship. In a referendum in 2015, Danish voters rejected ending Denmark’s justice and home affairs opt-out. These policy-specific referendums have made a ‘Dexit’ less likely even after Brexit. Voter preferences may be for maintaining control over specific policy domains, rather than for Denmark to quit the EU altogether. Brexit might have been avoided had the UK followed the Danish approach. The UK’s departure from the EU means Denmark has lost one its strongest allies within the EU, and outside the Eurozone. The UK has also been one of Denmark’s most important trading partners with the vast majority of exports of pork going to the UK. At the same time, Denmark’s trade exposure to the UK is not what it was in the 1970s. The integration of the Single Market now ties Denmark closely to those states remaining in the EU and in the Single Market. The trade consequences of Brexit for Ireland are also significant, with 17 per cent of Irish exports of goods and services going to the UK. But, like Denmark, Ireland’s dependence on the UK for trade has changed since the 1970s when 50 per cent of Irish exports went to the UK. Nonetheless, the economic shock of Brexit will be significant for Ireland and depending on what form Brexit takes – from a trade agreement to no agreement and the application of World Trade Organization (WTO) rules – it is predicted that output in Ireland will fall by between 2.3 and 3.8 per cent. Different sectors of the Irish economy will be exposed to the effects of Brexit in different ways, and the potential obstacles to trade will be different across sectors: from the risk of tariffs on agriculture, food and beverages to the non-tariff regulatory barriers in the pharma, chemicals and financial services markets. When it came to the big decision about the euro, Ireland chose a different path from the UK and Denmark. The UK’s decision not to participate in monetary union was not an impediment to Ireland choosing to do so. It was a defining choice for both countries. It now binds Ireland’s future more closely to that of the EU and the Eurozone. It is clear, then, that in withdrawing from the EU, the UK is making its own choice. Beginning today, I will be adapting and serialising chapters from Brexit Time. During the EU referendum campaign, the ‘purdah’ rules on pre-election political announcements shaped Brexit Time and influenced the timing and flow of political events. Before returning to these Campaign Times, it is worth reflecting briefly on the events of last week and how rules on ‘purdah’ continue to shape Brexit Time. 60 seconds. Four minutes. Accounts differ, but either way, the leaders of the EU27 took little time to adopt the guidelines for the negotiations of the UK’s withdrawal from the EU, at a special European Council meeting. The guidelines confirm the gulf between the position of the UK and the EU on the sequencing of these negotiations. For the UK – inspired by the hopeless optimism of Brexiteers – everything is possible and up for negotiation from the outset. For the EU, the Article 50 negotiations and the future relationship negotiations are different things with progress on the former being necessary before starting discussions on the latter. All this in the wake of a meeting between Theresa May and Jean-Claude Juncker earlier in the week, widely reported to have increased fears that no deal will be struck given the unrealistic – even ‘delusional’ – expectations of the UK government. In any event, the negotiations will not start immediately. It remains for the Council to agree and adopt the negotiation directives to be given to the European Commission as the Union’s Brexit negotiator. And with a general election now underway in the UK, the EU will have to wait until 9 June before discussions can commence with whoever occupies the top government posts after the election. Elections – and referendums – interrupt the normal conduct of political business. Pre-election or ‘purdah’ rules, restrict what governments announce and what decisions they take. Theresa May’s decision to call an early election has triggered these rules. One early consequence was the government’s bid to use the election to delay publication of its air pollution plans, despite ClientEarth’s earlier successful High Court legal challenge: the bid failed. However, the pre-election rules have had a more direct impact on UK-EU relations. Citing pre-election restrictions, on 25 April, the UK government informed other Member States that it reserved its position on a vote on a package of EU spending measures pending the outcome of the election. The reserve, however, has been interpreted as less the necessary consequence of domestic purdah rules and more an attempt to flex political muscle before Brexit negotiations get underway. The move has clearly annoyed the UK’s EU partners. Jean-Claude Juncker’s Head of Cabinet, Martin Selmayr tweeted that: “Now, we’ll have to apply FULL PURDAH RECIPROCITY. Talks with UK, formal or informal, will start only after 8 June’. In other words, the UK’s own rules will be used against it. For those agitating for a referendum on the UK’s relationship with the EU, the 2016 referendum had been a long-time coming. A combination of forces and events had brought the UK to this moment in time. Yet this ‘moment’ was equally a series of more specific campaign times, structured by law – the combined effects of the Political Parties, Elections and Referendums Act 2000 and the European Referendum Act 2015 – and by politics. An important restriction on the conduct of government during the referendum campaign arose from Section 125 of the 2000 Act which prevented the government and other bodies whose expenses are paid out of public funds from publishing material relevant to the referendum or to issues relevant to the referendum question. This period of ‘purdah’ applied for the four weeks leading up to the date of the referendum. However, when introduced to Parliament, the European Referendum Bill had proposed disapplying section 125. But as a sign of the divisions with the Conservative Party and as an effect of the slim majority obtained by the Conservatives in the 2015 election, an Opposition amendment reinstating the purdah rules attracted the support of a sufficient number of rebel Conservative MPs to amend the Bill. The date of the referendum had not been resolved by the European Referendum Act. It simply provided for a referendum to be held by 31st December 2017, leaving it up to minister to decide by regulations the precise date for the referendum. In many ways, it would have made sense to hold the referendum in September 2016. Indeed, there would be a considerable advantage in having the campaign run through August when Parliament would be in recess and normal government business would be quieter making it easier to apply the rules on purdah. A September plebiscite would also give the Prime Minister more time, if necessary, to undertake the reforms and renegotiation that would precede the referendum. But aside from the potential delay that a September referendum might entail, the main reason for avoiding September was the fear that newspaper and television headlines could be dominated by a summer refugee crisis. The consequence was that opinion crystallised around a June referendum. Even if the deal on the UK’s ‘new settlement’ had to wait until the February 2016 European Council, there would be enough time for the referendum campaign. On 3 March 2016, the European Union Referendum (Date of referendum etc.) Regulations 2016 designated 23 June 2016 as the date of the referendum. That meant that the ten-week ‘referendum period’ – significant in triggering the campaign rules of the 2000 Act – would commence on 15 April 2016. The Leave campaign had a difficult start to its campaign not least because it was not clear until days before the referendum period began who would be entitled to be the lead campaigner. Before the purdah period kicked in on 27 May 2016, there would also be six weeks of the referendum campaign during which time Government could actively pursue its policy of remaining in the EU, and contest the claims and assertions of Leave campaigners. This also gave the Government a clear deadline by which to publish reports in support of its position. Particularly noteworthy in that regard was an analysis released by the Treasury days before the purdah deadline in which it was predicted that Brexit would create a recession, loss of jobs and a currency devaluation. The report was heavily criticised by Leave campaigners, who challenged the economic assumptions behind the report and indeed, the role of ‘experts’ in public decision-making. At a more institutional level, it was even suggested that a traditionally sceptical Treasury had been overtly politicised towards supporting a Remain vote. For other observers, while the Treasury analysis itself was consistent with the analytical standards of departmental reports, the presentation of the findings on the Treasury website in ways that echoed the political spin placed on the report by the then Chancellor had drawn the civil service more directly into the political arena. The negative reactions to the work of the Treasury would later be criticised as a ‘consequence of departmental cultural hubris’ in a report prepared by Lord Kerslake, the former head of the Civil Service. The campaigns ended when voters went to the polls on 23 June. At 7.01 on 24 June 2016, Jenny Watson the Chief Counting Officer for the referendum and Chair of the Electoral Commission announced the referendum result. 17,410,742 votes were in favour of Leave; 16,141,241 were in favour of Remain. The UK had voted to leave the EU. 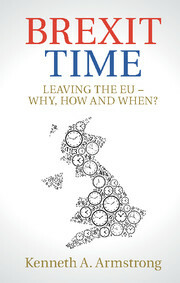 Brexit Time will be published by Cambridge University Press in June. The 2016 referendum result left a yawning accountability gap. A government which had campaigned for a Remain result was left to implement a vote for the UK to Leave. The Prime Minister which had chosen to hold a referendum resigned, with a new Prime Minister emerging not from a general election but from an internal leadership election within the Conservative Party. The governing party’s manifesto commitment to maintaining the UK within a Single Market has been abandoned by the new Prime Minister in her negotiating objectives for the UK’s post-Brexit relationship with the EU. Meanwhile, the Parliament that enacted the EU referendum legislation doesn’t know how to hold the government to account for its implementation of the referendum result. Parliamentarians would not themselves, by and large, have voted for Brexit and many – including within the governing party itself – do not support the ‘hard’ Brexit being pursued by the government. MPs find themselves pushed and pulled between the competing forces of their own beliefs, party discipline and the preferences of their constituents. It is time for a new government and a new Parliament. Theresa May has announced her intention to introduce into Parliament a motion that if passed by two-thirds of MPs will allow for an early election on 8 June 2017. It will be a defining election politically and constitutionally. Politically, for the Conservatives, Theresa May’s hand will be strengthened in Brexit negotiations if she wins a general election. The timing is ideal as no real Brexit negotiations will get underway over the next few months so instead of kicking her heels, the PM is seeking to augment her domestic political position with a view to using that to her advantage once EU negotiations get underway. Importantly, were the Conservatives to increase their majority in the Commons, the PM would also be in a better position at the end of the negotiations knowing that the risk of parliamentary veto would have all but gone away. Election time and Brexit time dovetail very neatly for the Conservatives. As for the other UK parties, this is the one and only time to seek to either stop Brexit entirely or to try and create a consensus about what sort of Brexit a future Prime Minister should seek. The Liberal Democrats should be the primary beneficiaries of this election in picking up seats from Labour in Remain constituencies like Cambridge which Labour took from the Lib Dems in 2015 and which they stand no chance of retaining in an election in June. The Lib Dems will also hope to repeat their bye-election victory in Richmond by picking up some seats from Conservatives. Nonetheless, unless the Lib Dems are in a position to form a coalition government with other Brexit-opposing parties, it is difficult to see how they can prevent Brexit happening. It is hard to avoid the conclusion that a June election will be anything but apocalyptic for the Labour Party. It may be the moment when Labour finally rids itself of its failing leadership but it will also come at an enormous price in terms of its future capacity to survive and win elections. Disaffected centre-Left voters will drift towards other parties including the Liberal Democrats. Perhaps surprisingly, this may also be the moment when the UKIP flush is finally busted. Having failed to secure electoral success at general elections in the past – including 2015 – UKIP may well find itself with no MPs whatsoever in a new Parliament. But the obvious political and constitutional threat lies with Scotland and this is where Theresa May is making her biggest and riskiest gamble. If the SNP were to repeat the sort of electoral success they saw in 2015 – returning 56 out of 59 MPs – on an electoral mandate for a second independence referendum, then it becomes difficult to see what can or could stop Scotland separating from the UK. The Prime Minister is gambling that the SNP’s electoral surge has peaked. But it is hard to imagine that an election in June will wipe out the SNP’s dominance among Scotland’s MPs even if it loses the odd seat here and there. By calling this election, Theresa May is potentially sacrificing the union between Scotland the rest of the UK in the hope of strengthening not just her Brexit negotiating hand but also her own political position and that of her party. Rightly or wrongly, if the complaint in Scotland has often been that voters end up with a government and policies for which they do not vote, an election on 8 June may simply confirm that impression, making the case for, and likelihood of, independence all the greater. Election time, Brexit time, independence time. The same rules and laws will apply on the day after Brexit as they did before. And it will be for the British Parliament to decide on any changes to that law after full scrutiny and proper Parliamentary debate. It is through the GRB that Theresa May intends to respond to the apparent desire of voters to take control over laws. But in seeking to domesticate EU law into national law on ‘Brexit Day’, the UK government is taming control. I have written elsewhere about the technical challenges that will face the government in incorporating the acquis in domestic law. Others have written eloquently on the devolution and delegated rule-making aspects of the GRB. This post focuses on some selected key issues raised by the White Paper. In order to domesticate the EU acquis the GRB seeks to covert directly applicable EU law into domestic law and to preserve rules that are already incorporated into UK law through secondary legislation by replicating the 1972 Act as a legal basis for these secondary acts with the GRB. The aim is to ensure legal certainty and clarity at the point that the UK leaves the EU. But much like the emerging position on immigration, rather than Brexit leading to a fundamental change, it is likely to mean that much will carry on as before. It is a curious feature of recent referendums in the UK – including the Scottish independence referendum – that the radicalism of the change being sought is tempered by political statements as to how much will remain the same. Nonetheless, it is the idea that the UK Parliament will in the future be able to decide what it will or will not keep that underlines the claim of restoring ‘control’. Yet it is a control that is displaced to another time and without any clear indication of the circumstances upon which that control might be exercised. One change is clear – the EU Charter of Fundamental Rights will not be a source of norms against which the legality of UK measures within the scope of EU law will be open to challenge. As to the interpretation of EU-derived rules in a manner that is consistent with fundamental rights, the implication is that it will be domestic standards in the form of the Human Rights Act will condition that interpretation. The Great Repeal Bill would also support the scenario where the UK left the EU without a deal in place, by facilitating the creation of a complete and functioning statute book no longer reliant on EU membership. After decades of complaints about Brussels ‘red-tape’, the UK Government is now seriously stating that it will countenance not only increased costs from tariffs but also the full application of all the regulatory norms and standards applicable to trade in goods and services after Brexit as a matter of domestic law. And this from a Conservative Government that has argued for free trade and reductions on the regulatory burdens on business. … the Bill will make clear that EU regulations – as they applied in the UK the moment before we left the EU – will be converted into domestic law by the Bill and will continue to apply until legislators in the UK decide otherwise. This is in effect what section 2(1) of the European Communities Act already does: it treats these regulations as a source of domestic law. The only difference seems to be that it is only those regulations that existed before Brexit Day which will be given this effect. To maximise certainty, therefore, the Bill will provide that any question as to the meaning of EU-derived law will be determined in the UK courts by reference to the CJEU’s case law as it exists on the day we leave the EU. This is a modification of what is in section 3(1) of the European Communities Act 1972. It is interesting that the GRB felt it necessary to say anything about this at all. It could simply have left it to the discretion of counsel and courts to see what use they made of CJEU jurisprudence as a guide to interpretation. But it seems clear that the issue is not just about the UK now having control over EU law, it is about the UK Government having control over UK courts. … we propose that the Bill will provide that historic CJEU case law be given the same binding, or precedent, status in our courts as decisions of our own Supreme Court. In other words, UK courts will not have the freedom to depart from this case law and the Supreme Court itself will normally be bound by such precedent departing only ‘when it appears right to do so’. The circumstances upon which a logic of appropriateness would drive the Supreme Court to drift from CJEU jurisprudence in the post-Brexit world is a thesis to be written. But in trying to lay down a marker – the CJEU jurisprudence as of Brexit Day – the GRB now creates confusion as to what to do with post-Brexit CJEU case law. On the one hand, the implication would be that it is not appropriate to refer to such case law given the more explicit instruction as regards pre-Brexit case law. On the other hand, the policy behind the GRB is to ensure consistency and certainty with the law remaining the same unless and until Parliament decides otherwise. One option could be that a principle of interpretative homogeneity should apply with it being for Parliament to correct any interpretations and applications of EU-derived law with which it wishes to depart. That would seem to be consistent with the general approach of the GRB. For voters who wanted the UK to remain in the EU, the risk was how much would change after the UK leaves. For those who wanted the UK to leave the EU, the hope was that, indeed, much would change. Both sets of voters may be surprised at the efforts being placed on seeking continuity in governance. For Remain voters, while this may afford some comfort, it will simply reinforce the view that the better way of keeping things the same was for the UK to remain a Member State of the EU. For Leave voters, the outcome may be more ambiguous. On the one hand, post-Brexit continuity would seem to be a rebuttal of ‘Project Fear’ claims about the risks from leaving the EU. On the other hand, the taming of control rather than the taking of control may well lead some to conclude that Brexit is an incomplete political project. This post is cross-posted on the excellent Verfassungblog by kind permission of Max Steinbeis.